One Ton of Plastic Pollution and Assorted Junk Removed from the Inland Bays! 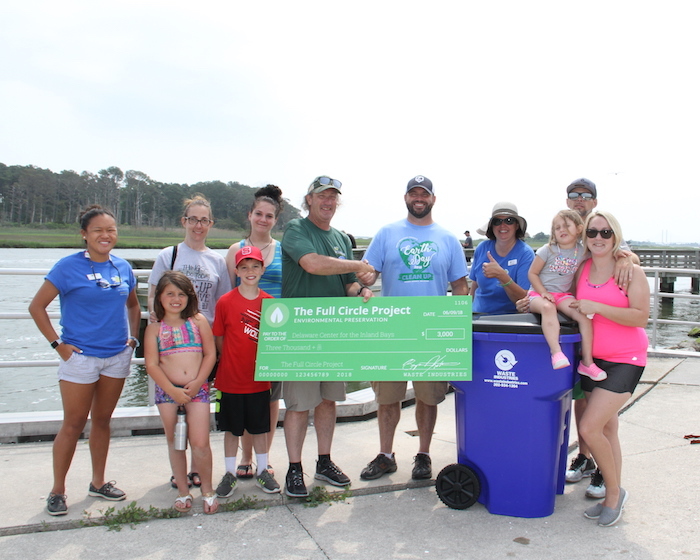 Indian River Inlet, DE — On June 9th, 54 energetic volunteers hopped aboard boats and scoured the shores of the Inland Bays, removing a whopping one ton of trash! Organized by the Delaware Center for the Inland Bays, this event was run with the assistance of DNREC’s Division of Fish & Wildlife Enforcement Section, and the Division of Parks & Recreation, with special help from the Coast Guard Station Indian River, and the Dewey Beach Lions Club. All together, 2,140 pounds (1.07 tons) of trash was collected and deposited into a dumpster provided by Waste Industries, Inc., and disposed of via the Delaware Solid Waste Authority’s Community Clean-Up Initiative, once again sponsored by State Senator Ernie Lopez. A special thank you to Waste Industries and The Full Circle Project for their generous donation to the Center! Trash in the Inland Bays can be harmful to the health and safety of visitors and marine life, both of which are important to a thriving tourism economy. The Delaware Center for the Inland Bays would like to extend a massive thank you to the many volunteers, organizers, sponsors, and supporters that came out to make our Bays beautiful at this year’s event!